We are always in need of foster homes to help us take in these precious dogs. If you have space in your home for one dog, please contact us so that we can go over the details. All medical expenses are covered for your foster dog if any is needed. Just provide a place to sleep in, food and water and especially lots of love and training. Foster care can be short term as well or even long term. We have had some families adopt their foster dog after a few weeks. This is a great way to test to see if a dog is a great fit for you and your family. Please contact Eva for more information. Thank you. Hello, out there. My name is Sophia. I'm looking for a new home. Life was good till my owner died. I was taken by a family member who surrendered me to a shelter. The shelter contacted Beagle Rescue telling them I'm a beagle mix. They agreed to take me, and here I am. The shelter also said I'm 10 years old. Mommy doesn't believe that for a minute. 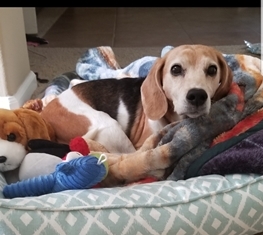 I love to play with toys and love to be with other dogs and with people My beagle heritage might be questionable at best, but I'm one of the nicest girls she's ever fostered. She says I'm missing the beagle stubbornness gene. I do have chronic dry eye in one eye. Other than that, I have no health issues at all. She says I could use a DNA test to determine just what I am. I know what I am, just the best dog anyone could ever find. If you're looking for a well-behaved family dog with loads of good personality, reach out to my foster mom Suzy to learn more about me. 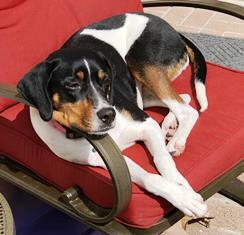 Hi my name is Lucee and I’m a 47 lb spayed female beagle/hound mix. I’m 3 years old and very smart! I live with my foster parents and little brother Chewy who is a Pomeranian/chi mix. We get along great and take walks together every morning. I have a lot of energy and take my toys in and out the doggie door to play. My mommy says I am a very “polite” dog and have never tried to jump up on furniture. I travel in the back of her Prius and never leave the back. Sometimes I like to crawl in my crate and have some “alone” time, but I sleep on a dog bed all night on the bedroom floor. My “ideal” family would be young and active (I love kids), or older and active, with a large secure yard for me to play in. I would love to meet you! Please contact my Eva for more information. River is a terrier/beagle mix, just over 1 year old, who weighs in at 17 pounds. She was abandoned as a puppy, which explains why she was timid around humans and reluctant on a leash. All that has changed now---after just a few weeks of love and attention in our home River has become an affectionate and enthusiastic little puppy that is comfortable in her kennel, cherishes human companionship and loves her walks. She has excellent manners: River is indifferent about human food and is perfectly housebroken; she is good with other dogs and rarely barks. River is a ‘winner’ who has won our hearts. It’s hard to imagine a home in which she wouldn’t become an instant and beloved family member. If you would like to learn more about River, please contact us. 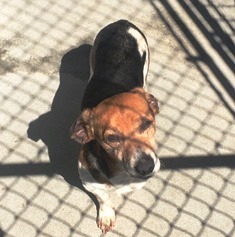 Buddy is a three year old former medical research beagle who is in need of a new home. 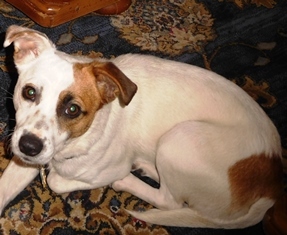 Buddy is sweet, friendly, does well with other dogs, and will be a loving loyal companion. 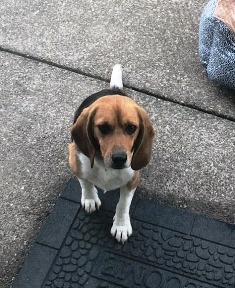 He is neutered, current on vaccines, and like some beagles he requires medication as he has been diagnosed with a seizure condition (which is a common health condition with the beagle breed). Buddy would do very well in a home with another dog for companionship and a family who will ensure Buddy gets his medication twice per day. 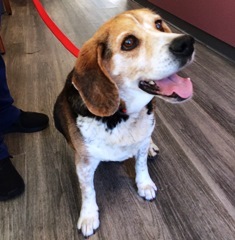 Buddy is a sweet lovable beagle and is ready to be spoiled in his new home! Please contact Eva if you would like to adopt Buddy. Wandering as a stray, Jacob was found hobbling along using three legs instead of four, as he ventured down the road before he was picked up and taken to a shelter. With good intentions at hand, Jacob was then taken to a veterinary hospital where it was learned through x-ray that Jacob’s front left elbow had previously been broken with no treatment received. 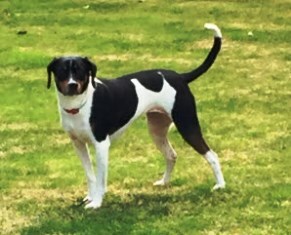 By appearances, it looked that Jacob’s elbow had been broken many years ago and thru resilience and determination, Jacob adapted by walking on three legs as his injured fourth leg was no longer working. Jacob entered the shelter as a stray with no name and with his sweet, kind, and gentle disposition he was soon given the named “Jacob”. Thankfully, the shelter contacted us for assistance when his owner did not come forward and soon after Jacob was officially in our care. Jacob is currently under the care of a veterinarian and given his weakened, non-functional front leg, surgery was recommended to have his leg removed. This will increase Jacob’s mobility as he will be able to walk more freely on his three legs. 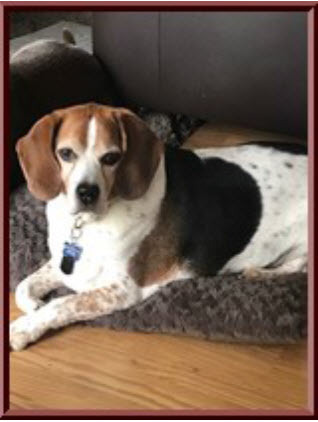 Although we will never know what happened to Jacob, all of us at Beagle Rescue are very grateful that he is now in our care. Through it all, Jacob’s sweet disposition has shined through and after his surgery he will go into one of our foster homes to stay during his recovery and until he finds an adoptive home. In Jacob’s name, we are asking for donations towards his surgery expenses. Donations towards Jacob’s veterinary expenses can be made by using PayPal or by mailing a check (payable to NCARF) to NCARF, P.O. Box 580327, Elk Grove, CA 95758. 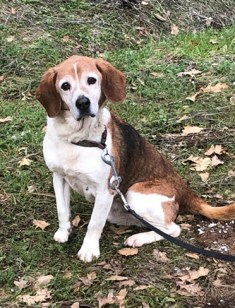 Jacob deserved to be saved and we are very happy that this sweet senior beagle boy is with us! Also, the pictures of Jacob are his shelter pictures and as time passes we will post additional pictures. If you would like more information about Jacob, please contact Eva. Hi Everyone. My name is Walter. I'm new here in rescue. I was an abandoned dog who was seen living under a junked car in a backyard with just a blanket to comfort me. I lived like that for over a year till someone took pity on me and I ended up with these rescue people. I'm a senior boy about 12 years old. In spite of being neglected and ignored for so long, I'm a friendly boy. Mommy says she's always amazed at what we can go through and still come out of it being normal dogs. I'm a lucky boy because I could be still living under that old car, but here I am instead. I was first taken to the vet where I had blood work done, was brought up to date on vaccines, and had a dental. The blood work showed that I'm low thyroid, so I'm on pills for that. The thyroid is why I could live like I did and still be overweight. I weigh 40 pounds. That will go down as the thyroid medication kicks in. Now I'm looking for a home where people will treat me right. I never want to see the underside of a car again -- ever. If you want to learn more about me, please contact my foster mom Suzy. I am Snoopy and I am ready to be your best friend. I like to relax in a comfortable spot in the house, but I am always ready to go on a walk, since I am great on leash and I respond well to verbal direction. I adore meeting people and they usually comment on how smart, cute and enthusiastic I am. The truth is, I am enthusiastic for food. I love food! I'll sing you something beautiful if you just give me a treat. I feel as perky as a young dog when food is offered. I am good with children and other dogs. However, I do become vocally excited when seeing other dogs, especially on walks. I just want to be friends with everyone. I am looking for a new home because my previous guardian was no longer able to care for me. 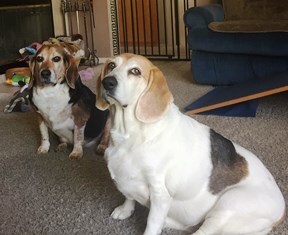 Description: Frankie is a 7 year old Bagel, Basset-Beagle, in good health weighing 63 lbs. He has fit in extremely well with his energetic foster family that includes two teenagers and two other dogs, large and small that he enjoys. He will get cross with small dogs if there is any provoking by them. Before his arrival it was advised that he not be in a family with small children and that he had never lived with other dogs. We believe the concern with small children would be over food. Frankie has a history of being at a heavier weight than normal but shows no excessive appetite or food obsession. He has been steadily and easily losing his extra weight since being fostered, with regular meals, walks and playtime. He likes toys a lot! Princess aka Princess Paisley came to rescue after being taken to a shelter in Nevada when the people who were caring for her no longer wanted her. After her owner had passed away she was taken in by a family whose small children were not too kind and after some time her second family took her to a shelter as they no longer wanted her. 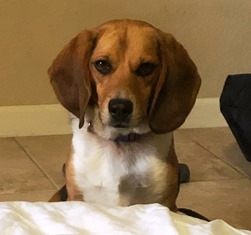 Thankfully, we were informed of Princess Paisley’s need for assistance and within a week’s time she was officially with Beagle Rescue! Once she came our way she was spayed, had her vaccines updated, and also had a much needed dental. She is now in her foster home where she is being treated with love and kindness like she so deserves. Princess Paisley loves to be with her foster mom and would do the very best with someone who has a very flexible schedule or who is retired. She also would do best as an only dog, where she would be spoiled, loved, and given kindness at every opportunity. 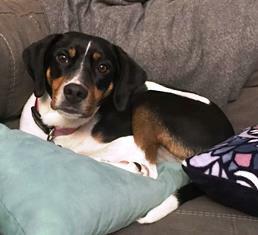 She is also pretty nervous around children given her past experiences so a home without children is a must for this sweet beagle. 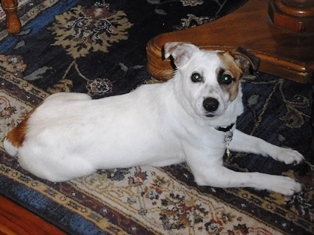 Princess Paisley is very sweet and will be perfect for someone who is looking for a devoted companion. Please contact Eva if you are able to open your heart and your home to Princess. 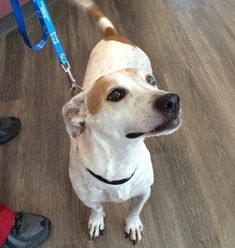 Luigi is a male, spayed beagle, approximately 12 years old. We have had him since he was 5. I believe he’s AKC registered and chipped. He loves his walks and running in the grass. He likes the sun and dirt. He loves people, kids, other dogs and is very playful. He cowers when men yell at him though, and we believe he might have been abused by the former male owner. He’s been a companion for our lab, who has recently gone completely blind and due to change of family circumstances, we are re-homing the blind lab and don’t think Luigi will do well alone. He is crate trained and used to sleep inside at night in the crate. However, due to major allergies, had to be relocated outside with the lab. Luigi hates thunderstorms and is “gun shy.” Fireworks and thunderclaps terrify him and he will hide trembling in his crate. We will be happy to keep Luigi until we are able to find a home for the lab. In fact, we’d prefer to not let him go until we find a home for the lab, but we definitely need to find a new home for Luigi. Luigi chases cats, squirrels, deer, and other small animals. He does fine with other dogs. Luigi would be completely fine indoors, however, he pees when he’s scared. Please contact his owner Carrie if you would like to adopt Luigi. Jake and Roxy are approximately 10-11 years old and have been together their entire lives. They ended up with Good Samaritans at the end of October 2018 due to tragic circumstances in which their owner took his own life. Jake and Roxy’s owner was a very good friend of the Good Samaritans and his passing was a complete shock. Jake and Roxy were essentially homeless as their owner’s estate /house was sorted out and sold. They had no-where to go and no one wanted them. Thankfully, the Good Samaritans stepped forward to take them as no one else wanted them in their care. They took them with the intention of finding them a new loving home however on November 8th the Camp Fire happened and life as they knew with the Good Samaritans was upended. Thankfully, the home of the Good Samaritans remained standing and once allowed to return home all was in place with exception of the fencing which was broken when the fire crews came on the property to protect the house. 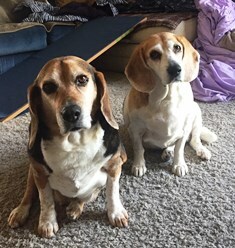 With now free reign to unprotected areas, the Good Samaritan’s asked for our assistance as they knew that they could not offer the most optimal home for Jake and Roxy until an loving adoptive home was located. The Good Samaritans shared with us that Jake and Roxy are very sweet dogs who have been accustomed to being spoiled and loved their entire life right up to their owner’s death. Jake and Roxy were both very heavy when they arrived at the Good Samaritans home as they were used to indulging in people food frequently. However, there sweet dispositions continue to shine even though they have been through so much. When Jake and Roxy first came to rescue they were seen for their veterinary care. Both had their vaccines updated, heartworm tested (negative), thyroid tests done (both have normal thyroid) and blood work completed. Roxy also had an additional test completed which confirmed that she has Cushing Disease however she is asymptomatic at this time. The Good Samaritans had planned to obtain their veterinary records/history however the devastation of the Camp Fire also included the veterinary practice where Jake and Roxy were previously seen. Jake and Roxy are now in a loving foster home together as they await a new family to call their own. Both love attention and enjoy a belly rub (Roxy likes hers especially in the morning when first waking up and Jake likes his as soon as he is done with his wake up routine). Jake and Roxy are losing weight and take daily walks with their foster mom, which they really enjoy!! Jake is described as an old soul and is a very sweet boy who loves attention and squeaking his toys. Roxy loves her walks and can be spunky at times too. 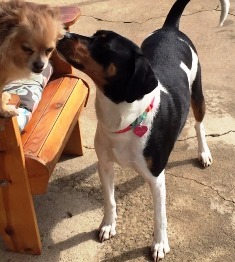 Both are very sweet loving dogs who would love to have an adoptive family where they can be together. Please contact Eva if you would like to adopt Jake and Roxy. I was living a life of no drama till my owner died, then the drama began. No one wanted me, so I was taken to the shelter. 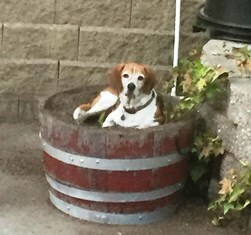 From there I went to Norcal Beagle Rescue. First I had to go to the doctor's office where I was spayed, had a dental, and had a benign growth removed from my side. I came from the clinic to my new foster home where I am right now. I did test positive for Cushing's. Mommy says that's a disease she doesn't know anything about. 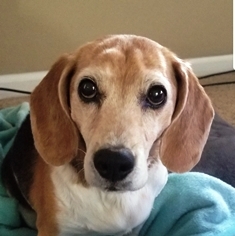 She's had other beagles with it, and they had no symptoms. I also have no symptoms. I act like a healthy beagle girl, and I'm a good girl because I'm grateful to have a second chance here. I don't bark a lot unless you've been away and just come home. That's because I'm so happy to see you that I have to tell you. I'll also bark at dinner time if I think you're too slow in giving me my food. I do love to eat, and it shows. I'm overweight and need to lose a few pounds. Mommy is very strict with the food here. She says it's for my own good. If you're looking for a well-behaved mature girl to love you, please contact my foster mom Suzy to learn more about me.